Making good bets on the horse racing used to be for those who had a deep understanding of all of the elements of the sport or back end connections to the horses or their trainers. As odds makers began to get better at figuring these factors out, horse betting became a past time that less experienced betters could join in on and actually create winning systems. Those who do well today have learned that there are some key factors to consider when betting on the ponies. These are the main things to do so that can help you bet like a professional. For some reason many people think that they can look at a racing form and pick an underdog who will beat a heavy favorite. The reality is that these odds are in place because they show the likely outcome of the race. To be clear, often how odds are calculated are not always accurate and are based on past performance, so there is some room for inaccuracy, but you have to know if and how other factors can influence the real odds. You can check the latest racing info and odds from 188Bet. With this said, the favorite will come in the top two spots more than 50% of the time in a race and more than 2/3 of the time in the top three places. So consider this heavily when you make your bets. Think about what other factors may influence these odds, but be sure that the additional factors you consider are real. Trainers are like Football coaches some of them are able to take good horses and make them perform great all the time. So you need to see who the trainer is for the horses in a race and understand that betting against them means you are taking a risk. If you are not familiar with the trainers then look for the record of the trainers in the race. Aim for those who have won at least ten percent of their mounts and have done this consistently. These records can be found on all Take a look at the record of the trainer with that particular horse also. How are they doing together? If they have a good record, chances are their good performance will continue. You may find that there are several top trainers with horses in a particular race. In this case, you have narrowed down your betting choices to a few horses rather than the whole field. 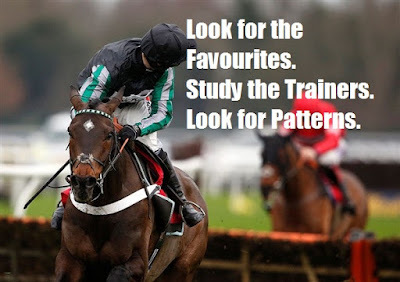 Get information on the horses previous seven to ten races and see if you notice a pattern about how they compete. Some horses will compete consistently while others will only do so during certain races. There is no guarantee that a pattern will reveal itself but there is a possibility that you can notice something. Maybe you see that the horse wins everything race or at least is very competitive. If this is that third race, this may be a great opportunity to make the bet.